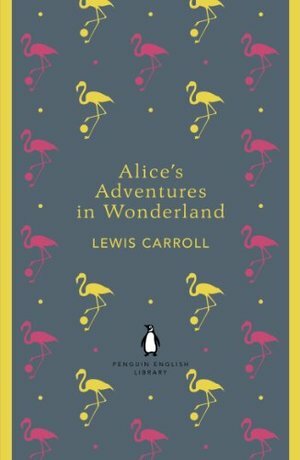 This is the "Penguin English Library Edition" of A"lice's Adventures in Wonderland and Through the Looking Glass" by Lewis Carroll. '"Curiouser and curiouser!" cried Alice (she was so surprised, that for the moment she quite forgot how to speak good English). "Now I'm opening out like the largest telescope that ever was! Goodbye, feet!"' 'I had sent my heroine straight down a rabbit-hole ...without the least idea what was to happen afterwards,' wrote Lewis Carroll, describing how Alice was conjured up one 'golden afternoon' in 1862 to entertain his child-friend Alice Liddell. His dream worlds of nonsensical Wonderland and the back-to-front Looking Glass kingdom depict order turned upside-down: a baby turns into a pig, time is abandoned at a disorderly tea-party and a chaotic game of chess makes a seven-year-old girl a Queen. But amongst the anarchic humour and sparkling word play, puzzles and riddles, are poignant moments of nostalgia for lost childhood. "The Penguin English Library" - 100 editions of the best fiction in English, from the eighteenth century and the very first novels to the beginning of the First World War.